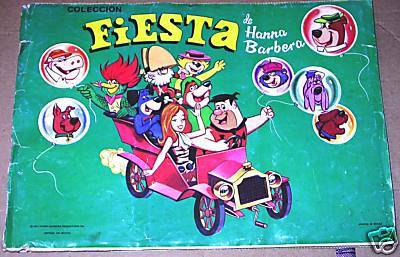 Three Hanna-Barbera stamp albums were published in Mexico with copyright dates of 1971. 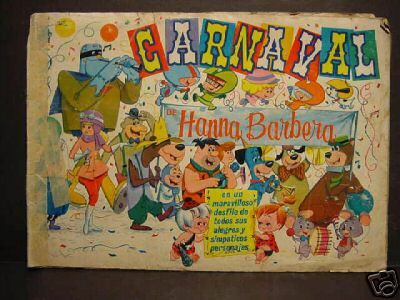 We've verified Jonny Quest pages in two of them, "Carnaval de Hanna Barbera" and "Fiesta de Hanna Barbera." 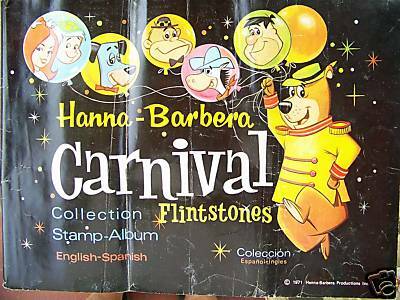 We haven't seen any stamps from the third, "Hanna-Barbera Carnival," but it may be the English version of the Carnaval book. 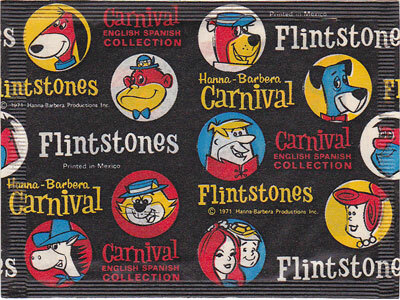 Most of the albums are stickers for other Hanna Barbera characters like the Jetsons, the Flintstones, Scooby Doo, Yogi Bear, Snooper and Blabber, Quick Draw McGraw, Mr.Jinx, Huckleberry Hound, Top Cat, Peter Potamus, Atom Ant, Banana Splits, Ruff and Reddy, The Impossibles, Mighty Mightor. The albums measure approximately 14 x 10 inches. As you would expect, you bought the albums and the stickers separately. Below are pictures and scans of the books and the envelopes of stickers. Note from Craig: Because of the Spanish content on this page, I discovered my browser was trying to auto-load a translation helper and causing a malware alert. If this happens to you and you don't see a benefit to it, you should be able to disable that feature in your browser settings for add-ons or accelerators. Larger images thanks to Jim Alexander. 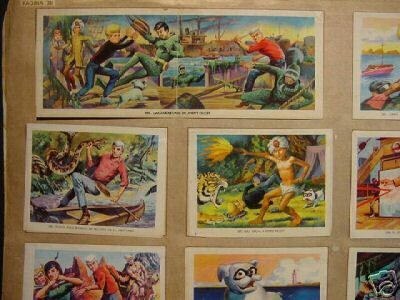 Sticker 294 - a double wide sticker: "Las Adventuras de Jonny Quest"
Sticker 295 - "Jonny Quest y Bandido se disponen a bucear"
Sticker 296 - "Roger Race Bannon en peligro en el Amazonas"
Sticker 297 - "Haji salva a Jonny Quest"
Sticker 298 - "El Dr. Benton Quest se enfrenta el rayo lazer"
Sticker 299 - "Jade y Race Banon se libran de ser sacrificados"
Sticker 300 - "Bandido el valeroso perrito de Jonny Quest"
Sticker 301 - "Jonny Quest contra los hombres lagarto"
The front side of an envelope of stickers for the Carnaval book. It's very thin, so there may have been only one to two stickers inside each envelope. 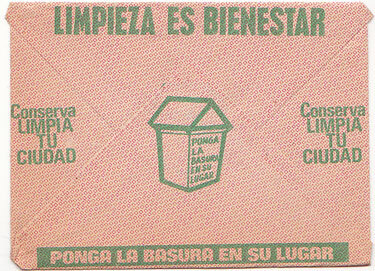 The back of a Carnaval envelope. The Carnaval envelopes are smaller than the envelopes for the other books, but the stickers inside seem to be the same size. 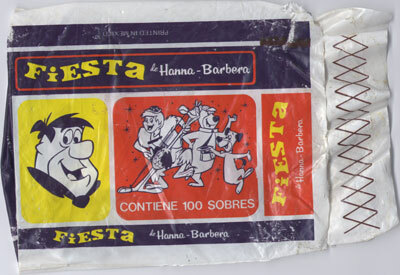 A plastic bag that contained 100 envelopes of stickers from the Fiesta set. 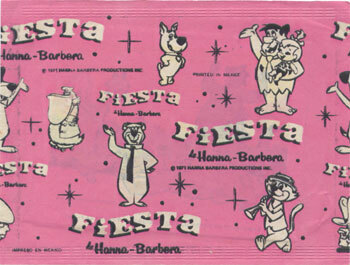 An envelope of stickers for the Fiesta book. It's very thin, so there may have been only one to two stickers. 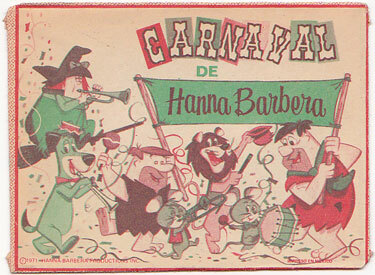 The cover for the English-Spanish "Hanna-Barbera Carnival" stamp album. An envelope of stickers for the Carnival book. It's very thin, so there may have been only one to two stickers in each envelope.